Mount Saint Helens is located in Washington, about 55 miles northeast of Portland, Oregon, and 95 miles south of Seattle. It is a volcano which is a part of the Cascade Mountains. It was recognized as a volcano in 1835 for the first time. It is sometimes referred to as ‘Mount Fuji of America’. It has erupted more frequently than any other volcano in the Cascade Range during the past 4,000 years. Most part of this volcano is less than 3,000 years old which makes it younger than the pyramids. Mount Saint Helens erupted on May 18, 1980. This eruption was the most economically destructive one. A total of 57 people were killed, 250 homes destroyed. It was the deadliest volcanic eruption in US history to date. Beetles and spiders were the first creatures to return to the site of eruption after 1980. This volcano had continuous minor eruptions from September 2004 to January 2008. In August 1982, it was declared as a National Volcanic Monument. It is administered by the National Forest Service. It covers an area of approximately 110,000 acres and about 1.5 million people visited between 1982 and 1989. At its highest point, it is measured to be 4,400 feet high. The upper slopes remain covers with snow up to 15 feet deep. It was named by Commander George Vancouver after Alleyne Fitzherbert. He was a British diplomat and his title was Baron St. Helens. The base of Mount Saint Helens is approximately six miles wide. Approximately 3,600 years ago, another eruption took place. It was several times more powerful than the 1980 eruption. Declan, Tobin. " All Facts for Kids about Mount Saint Helens ." Easy Science for Kids, Apr 2019. Web. 21 Apr 2019. 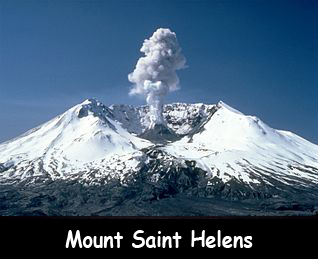 < https://easyscienceforkids.com/mount-saint-helens/ >.